A weekly music school for students age 7 and up! A part of Bayside Church. Thriving Churches International is proud to present the Thrive Arts Academy at Bayside Church, a weekly performing arts school. It’s our goal to help your students launch into their passions for the arts- a passion they can use to impact God's kingdom! Music Lessons take place on Bayside’s Granite Bay campus, in the upstairs classrooms of the Thrive Kids building, and on the Blue Oaks campus. Dance and Acting Lessons are held at the Blue Oaks campus. What's expected of the parents? Your involvement as a parent will determine what your student can achieve in the program more than any other factor. At the Academy, we’ll ask you to partner with your child’s instructor, helping guide practice time at home and joining younger students (through elementary school age) in their weekly lessons. We realize that this is a unique approach, but we strongly believe that this is the single best way to encourage your student’s success. Who are the Music Lessons instructors? 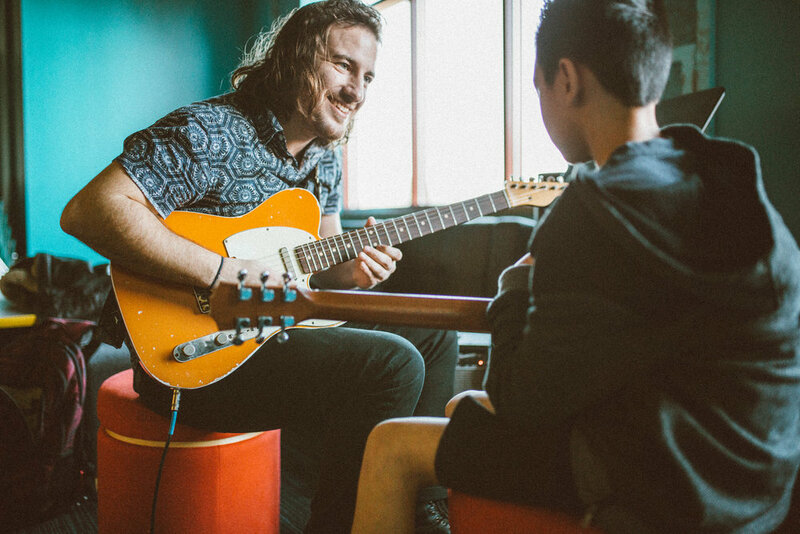 Music Lessons are taught by trained and trusted musicians from Bayside’s large volunteer base, specific partner instructors with a proven track record, and advanced students from our Thrive School of Worship. Every instructor has been through our background check process and is a great choice for your student. Will students need to own their own instrument? Yes. Every student will need their own instrument that they can practice with at home. We’ll provide Drum and Piano students with instruments in the classrooms for their lessons - no need to lug that gear around. Guitar and Bass students will need to bring their own instrument to every lesson, but we’ll provide amps in the classrooms. How much do Music and Dance Lessons cost? Tuition for the Thrive Arts Academy Music Lessons is $140 per month. This covers weekly lessons for one student, on one instrument, and the costs for both of our program’s recitals. Dance Lessons are $75 per month for one hour a week and increase incrementally the more hours a student is enrolled in. What's the Music Lessons make-up policy? We want to make sure that the lesson schedule works great for both the students and the instructors. Each student will get three make-ups during the school year, and one during the summer. If you or your student's instructor need to cancel, the rescheduling process / make-up process is very easy, and you can do it all online. What's the next step for Music Lessons? If you've read through this page and are ready to join the Arts Academy, that's awesome! It's time to sign-up for your first free lesson. As soon as you sign-up, you'll get an email to set up your first free lesson, so you can meet your student's instructor. They'll answer any more questions you have and help you decide if the Arts Academy is a good fit for your family. If you're not quite ready to jump in, but want to stay updated with Arts Academy developments, sign up for email updates!